Next performance: Dec. 16 at 4 p.m. and 7 p.m.
My former wife, who died decades ago from Multiple Sclerosis, was a concert pianist. There are a handful of piano concertos that I consider “Jennifer concertos” (concertos she played), which means when they show up on a schedule I draw a big circle around the particular date. One of those is the Saint-Saéns Piano Concerto No. 2 in G minor, Op. 22, which was (for me, at any rate), the centerpiece — both literally and figuratively — of the Pasadena Symphony’s concert yesterday afternoon and evening in Pasadena’s Ambassador Auditorium (I saw the afternoon performance). The soloist was the young, award-winning Chinese-born pianist now known as Zee Zee, pictured at the top of this post (I assume she changed from Zhang Zuo because Zee Zee is easier to spell and pronounce). 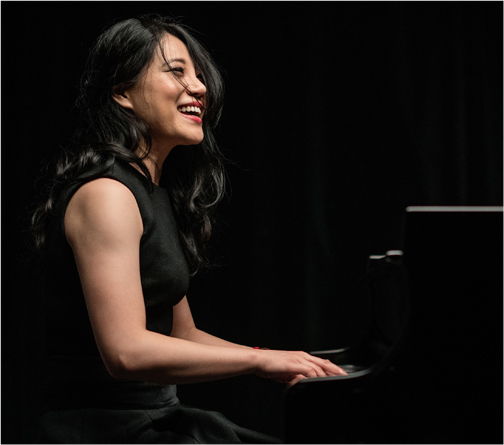 Unlike her compatriot, Yuja Wang, Zee Zee came on stage wearing a blue formal gown — she preferred to let the music and her music making speak for itself. And speak it did, wonderfully. Saint-Saëns’ second piano concerto was once a staple on concert programs but it has fallen into neglect these days. Zee Zee argued a persuasive case for its reintroduction. Her rendition of the lengthy solo fantasia that opens the work was both powerful and musical and those qualities permeated the balance of the concerto, as well. She sailed through the work’s numerous flying octaves with aplomb while at the same time playing trills and runs with effortless pearl-like delicacy. It was a tour de force in the best use of that phrase, and she is somebody the PSO should re-engage as soon as possible. Music Director David Lockington elected to construct yesterday’s program in an old-fashioned manner: 18th century overture, followed by the concerto and then a Mozart symphony. In doing so, he reminded all in attendance why this format and this music has remained so popular for nearly two centuries. Lockington opened the program with Rossini’s Barber of Seville Overture, leading a striking performance that melded extraordinary precision with sensitive musicality. Those qualities were also evident in the concerto accompaniment and in the concluding Mozart symphony (No. 41, Jupiter). The Pasadena Symphony usually offers excellent programs — especially when you consider it plays just seven sets of concerts during the season — but yesterday they pushed their level of excellence up a notch or two with their performances.